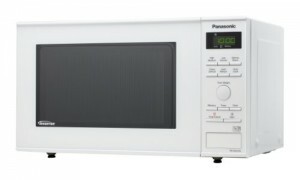 The Panasonic NN-SD251WBPQ provides a medium sized capacity of 23 litres, complete with a substantial 950w of power. Finished in white, it appears smart yet functional, and will match kitchens with white or light coloured suites of appliances. 6 different power levels are included, with 10 auto programs to make cooking regular items easier and more efficient. Also featured is Panasonic's Chaos Defrost which helps to provide an evenly distributed defrost wave - resulting in food defrosting uniformly. The microwave interior lining is finished in acrylic for easy cleaning, and a built in child lock helps to avoid accidents from little hands. Regarding size, the interior removable turntable is 28.5cm in diameter, with internal dimensions of 31.5cm by 20.6cm by 35.3cm and an overall weight of 9.5kg. The exterior measures 48.8cm by 27.9cm by 39.5cm. The controls are very well labelled, with clear black text against the white body - and overall our testers found this model very easy to operate. In use, it is very quiet, which impressed our testers. 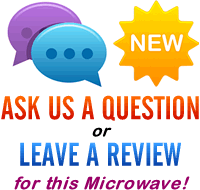 Overall the Panasonic NN-SD251WBPQ is a decent solo microwave - it works well, is easy to use, looks smart and should provide years of service.